Question: What is the main focus of the business? Answer: Our main focus is to ensure that primary school children have a comprehensive knowledge and understanding of all aspects of the key stage one and key stage two maths and English curriculums. Also of course, a significant part of our work is to prepare appropriate candidates for the grammar school entrance exams which, in addition to maths and English includes verbal and non-verbal reasoning, and we consistently achieve excellent results. Question: What ages of children do you tutor? Answer: We specialise in tutoring primary school children from 6 years-of-age, right through to 11 years-of-age when they leave primary school to begin their secondary education. Question: Do you just tutor for entrance exams, or do you cater for all levels of ability? Answer: Of course, entrance exam preparation is a large part of our business and we prepare children for every aspect of this, which in addition to Maths and English, includes Verbal and Non-Verbal Reasoning; mock exams; graded assessment tests; etc. However, not every child is cut out for a grammar school and - space permitting - we do tutor children of all levels of ability, with a great deal of success. Question: Tuition is a very competitive business and yet John Cashin A* Tuition is going from strength to strength, with a proven track record of success. What would you say sets you apart from other tutors? Answer: Well, many tutors are part-time, subsidising another main job, and because of this they tend to approach tuition in a fairly casual way. We, on the other hand are a professional, full-time tutoring business and specialise in one-to-one tuition for every child, as we believe that tutoring groups is not nearly as effective. We are skilled in identifying and addressing each child's specific needs, unlike many other tutors who tend to adopt a "one-size-fits-all" approach. We are strong on commitment and spend a good deal of time in lesson planning, in addition to the time spent with each child in his / her lessons. Also, many tutoring companies tend to favour standard computer programmes, making tailored tutoring to children's needs difficult, or in fact impossible, missing the mark and failing to deliver the necessary understanding. By contrast, our teaching methods are traditional, which we have found to be the best, time-tested and proven way to draw out children's potential and develop their abilities. When parents enrol their children with us, they usually keep the place until their child finishes primary school and often pass the place down to a younger brother or sister. The proof of the pudding is in the eating, which is why, for several years we have not needed to advertise, as the vast majority of families enrol their children through recommendation from other families. Question: What is the meaning of the Latin motto on your paperwork and website banner? Answer: Our Latin motto: Sola Fide, Sola Gracia, Soli Deo Gloria, which testifies to our strong Christian faith, means: By faith alone, By Grace alone, To God alone the glory. When children first come to us they take an assessment test. These assessments are designed to provide the tutor with a good understanding of the child’s abilities and learning needs. Following completion of the test, the tutor marks it with the child and then explains the resulting information to the parents. We are strong on commitment at John Cashin Tuition and the tutor is involved in a significant amount of work apart from the hour each week spent with the child, with all lessons carefully tailored to meet each child’s individual requirements. All tuition is booked by the term and fees are payable before tuition commences. 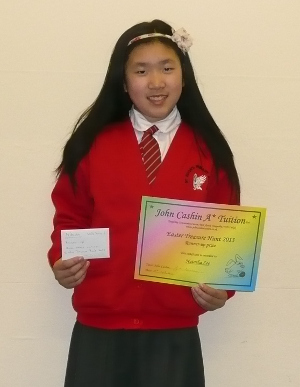 Children generally enjoy their sessions at John Cashin Tuition and grow in ability and confidence. Parents and teachers are pleased to note positive changes, which often occur relatively quickly when children are tutored by John Cashin Tuition. Investing in a child’s education is one of the best things any parent, or grandparent, can do. As the world becomes increasingly competitive in every sphere, children need all the help and encouragement their family can secure for them. The benefits are enormous. Sadly, many children who do not have the benefit of private tuition fail to reach their potential, and count the cost in later life. 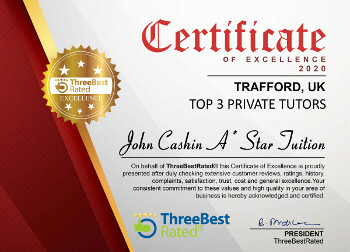 With first class private tuition from John Cashin Tuition, the opportunities and possibilities for the future are very much enhanced.